With the whole “weeds are just misplaced plants” concept I’ve tried to start researching each weed with an open mind. Until now. I have nothing good to say about Longspine sandbur (Cenchrus longispinus), also spelled "sand bur." I see nothing good about them, except perhaps as the inspiration for Velcro. When I was younger we lived in northern Minnesota where there were no sandburs. My first introduction to sandburs was on a visit to my grandparents. I confidently plopped myself down in the field without checking the ground first. I have a very early memory of my dad upending me over his lap to remove the offending burs while continuing his conversation with the other adults. Even as I sobbed I wondered if this was not quite a proper living room activity. We later moved to that same area and I remember my 10th grade biology teacher talking about the “Great Anoka Sand Pit.” At the time I thought he was joking. Since then I’ve learned there really is such as thing as the Anoka Sand Plain (I guess that could have been what the biology teacher said -- I may have misunderstood him). The Anoka Sand Plain covers an area north of the Twin Cities with the Mississippi River as the western boundary as far north as St. Cloud. The eastern boundary is North Branch. Included in this area is the Sand Dunes State Forest (which sounds like an oxymoron to me, but that’s the name of it). This is a wilderness area in Sherburne County about three miles west of Zimmerman and five miles north of Big Lake. It covers over 11,000 square acres...and sandburs abound. Sandburs are an annual grass that produce several stalks from the base. It looks a lot like any other grass when it first sprouts except the stalks are often purple or red at the center. The stalks can grow to two or even two and a half feet long and can either grow upright or sprawl across the ground forming almost a mat. 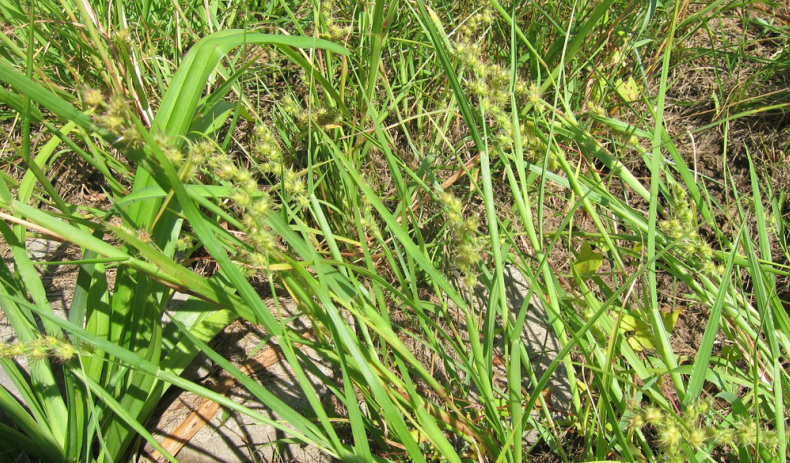 That means that even if the sandbur grass is mowed down before it goes to seed the sprawling stalks will still set seed on the ground below the reach of the lawnmower blades. Each stalk has 4-20 spiny burs at the tip. Each bur has one to three seeds. Unfortunately, sand burs are easy to please. They can take full to partial sun, moist to dry conditions. They prefer open sandy soil but they will grow in non-sandy soil as well -- anywhere there is open ground, basically. The burs are dispersed usually by clinging to animals, clothes, shoes and bare skin. They are particularly nasty after they’ve dried out. The bur tips can break off when the bur is pulled off and cause a irritation that can last for weeks. Is there anyone who can find any redeeming quality of sandburs?